The novels of JK Rowling have crossed all generations and cultures around the world. The Harry Potter movies have also captivated the Boy Who Lived stories so much so that the magic of this mystical world needed to be made into a theme park. Being declared the official ThemeParkHipster, I’ve decided to make a list of 7 ways to enjoy the Wizarding World of Harry Potter with the family. We all know that with any family vacation, the day goes much smoother if it is planned out…especially if it’s for a Florida theme park. With summer right around the corner, the only way to survive the peak season at the Wizarding World of Harry Potter (WWOHP) is the come up a game plan for the whole family. For example, going during the weekday instead of the weekend or staying onsite to take advantage of the Express Pass program is a great first step to planning out your vacation. This tip is always given over and over and over again, but it’s one of the most important tips for having a delightful time at any theme park especially WWOHP. If the park opens at 9am, then try to be at the Islands of Adventure gate by 815am. I know it sounds ridiculous, but that one little plan in your trip will make the visit into Hogsmeade so much more magical and exciting! It’s also good to come back later in the evening and walk through the various shops. The crowds are low and you can take your time to look through the merchandise from Filch’s Emporium, Honeydukes, the Owl Post, and more! Once you have walked through the famous gates and have heard the legendary train whistle loudly, you should head directly back to the Forbidden Journey attraction (located inside of the Hogwarts castle). The queue for this line is always the longest of the park, so get there early and take advantage of the short line. If you have little ones who do not meet the high requirement (48 inches or taller) you all may still walk through the queue line to explore the castle, where there’s a child swap waiting room for parents who would love to follow Harry, Hermoine, and Ron on their broomstick adventure. This is an experience for the young and the old. I consider myself a “grown kid,” so I can only imagine how his magical touch can take a family’s vacation to next level. He gives an awesome rendition of the mystical wizard mentioned in both the films and books. The one tip I have for families is if you have little ones who you think are the cutest kids in the world (we all do J), then make sure to stand in the front of the presentation. This will likely increase your child’s chance of being chosen by Olivander for a wand. When you walk up to Olivander and are intimidated by the long line, just remember that it looks more ferocious than it really is. The line goes by quickly with groups of about 15 guests who go in for each presentation. I’m usually a frugal type of traveler, but when it comes to engaging myself into the Potter universe I hop right in the line with my wallet and appetite to eat the deliciously prepared British fare with other wizards, witches, and muggles. I recommend for families to plan to come right before the lunch rush or afterwards. It’s much quieter and less hectic, especially if you have little ones. 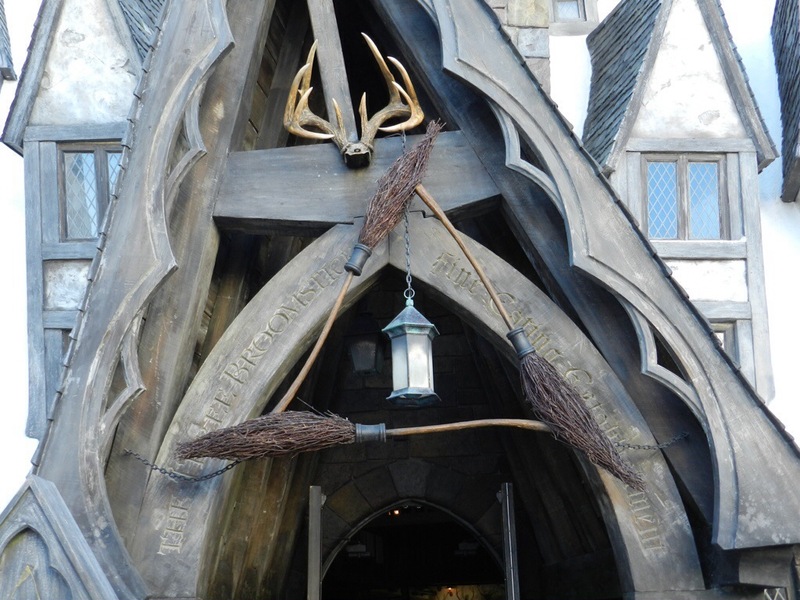 The Three Broomsticks also serve breakfast and dinner. Ahh…butterbeer for the whole family on a hot Florida summer day. Just the thought of it makes me want to find a cozy seat overlooking Hogwarts with a frothy mug of butterbeer. If you’re not a fan of root beer or cream soda inspired drinks, then I suggest that the whole family orders one cup to share and taste just to say they’ve conquer butterbeer while walking through Hogsmeade. 7. Look up, look down, look everywhere! One of my favorite traditions when visiting the WWOHP is finding new things that I’ve never noticed before. For first timers it maybe Moaning Myrtle bothering you in the restroom and for others it maybe noticing the shadow of a house elf quickly walking upstairs in the Three Broomsticks. This is a good way to explore and enjoy Rowling’s world as a family if the rides and other attractions are too long. Remember to just have fun and enjoy the real life magic that Universal Studios has brought to us through the Wizarding World of Harry Potter. If you are a fan of this series as much as I am, then being in the environment will make for a great theme park vacation no matter what! Bio: NikkyJ is a ThemePark super fan, a Writer, a Blogger at ThemeParkHipster.com, a Clinical Pharmacist, and a lover of life who currently resides in Tampa, Florida! I love WWOHP. I feel like such a dork when I’m there! I was loving and pointing out all the hidden gems (Like Moaning Myrtle) everywhere. Even the queue lines are draped with tons of memorable movie/book references. We were quizzing each other on HP trivia while in line. It’s those small little touches that make the park so special.